The idea of habit training can be both encouraging and overwhelming. It’s encouraging because finally something clicks and makes sense when it comes to our children’s education and behavior. All those failed sticker charts and incentives were aimed at the wrong place. But then when we realize that we, the mothers, are responsible for shaping the habits that will help lead our children to successful lives- that is an overwhelming thought! I’ve written a lot about Charlotte Mason’s ideas on habit training, but today I specifically want to talk about the often overlooked portion of Charlotte Mason’s 7th principle: education is a discipline. In the past, I’ve sped to the end of this principle to get to the good stuff- habit training! But I wanted to take a different approach today. Discipline and punishment are two terms that are often used interchangeably. They’re not the same at all, though! Punishment moves in with an “I’ll show you!” mentality. The punishing parent acts out of anger to seek vengeance for wrongdoing. If a child is scared because of a harsh punishment, there’s a good chance that he won’t do it again. Punishments like spankings, writing sentences over and over again, or shaming a child, don’t teach them what is right, but scare them from doing wrong. I think these things develop a child’s view of an angry, punitive God. In the same way, discipline is not rewards. Sometimes, moms who are new to habit training cling to their old tactics of behavior control. This might be a sticker chart or a jar of marbles that is added to when their child obeys. Not only does this prevent them from developing any self-compelling power to do what is right, but it can serve as a kind of punishment in itself. I wrote about these tactics that Charlotte Mason warned us to avoid in her 4th principle. Her 7th principle tells us more about what we should do- train our children in positive habits. Discipline in habit training is a gentle, guiding hand that continually points a child towards what is right. Sometimes it means allowing them to experience an unpleasant consequence of their decision. Sometimes it means giving a relative consequence that will gently teach them what is right. But, at least in the beginning, it is a mother’s self-discipline that will make habit training successful. 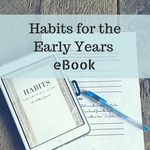 Ultimately, we want our children to be self-disciplined in their own habits. But this does not come naturally or easily. When I taught in public schools, a frustrated parent sat near my desk to ask about her son’s organizational skills. She didn’t understand why I constantly asked her to sign planners, told her when her son hadn’t finished his homework, and called her regularly at home. She thought that he should be responsible for these things. While there was some truth to that, he didn’t have anyone gently guiding him towards organization and self-discipline. This is an important lesson for habit training. We want our children to want to obey, to want to help out around the house, to want to do as they ought; but they will need guidance to get there. Their reliance on our own self-discipline is especially important during our children’s early years. If we are inconsistent and fail to follow through with habit training, we leave them to their own nature. An idea that I heard several years ago that really settled in my heart is that we should pray for our children’s weaknesses to show up now. When we still have them under our roof; when we still serve as their friendly ally in habit training; this is the only time we have to really help our children grow in their habits and character. This also changes my perspective on the process of habit training. When I feel frustrated that we’re still working on the habit of obedience, I remember that it is truly a blessing that I can help my children with this infinitely important habit right now. I love everything about this post :). I especially love the ending about being thankful for their weaknesses to be showing up now. I am going to try to bring that to mind next time I’m frustrated about still working on particular habits ;). Thank you, Samantha! I definitely need to work on this area!! A habit training eBook and helpful tips sent right to you!